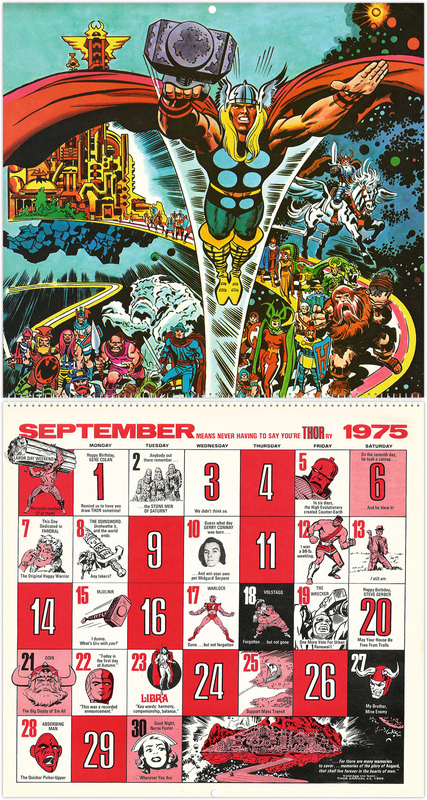 The Mighty Marvel Calendar for 1975 | 'TAIN'T THE MEAT… IT'S THE HUMANITY! My work load has been extremely heavy recently, and that combined with a nasty head cold will result in this week’s post being a short one (but let’s face it, it wouldn’t be Christmas without a cold). 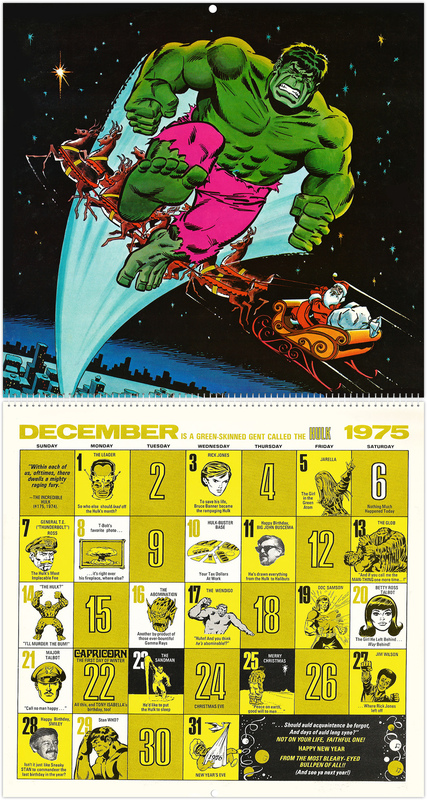 It also wouldn’t be Christmas here at Taint The Meat without a look at a vintage Marvel Comics calendar, and this year it’s the turn of 1975. 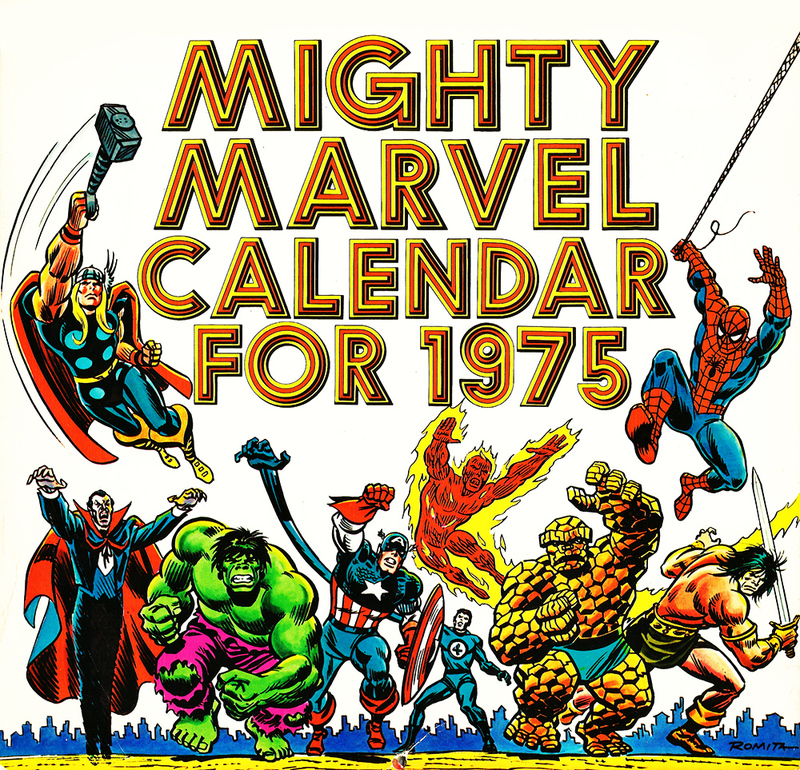 The Mighty Marvel Calendar for 1975 was the first of seven calendars produced by Marvel (click here for 1976, 1980 and 1981) and it introduced the style that the others would emulate. 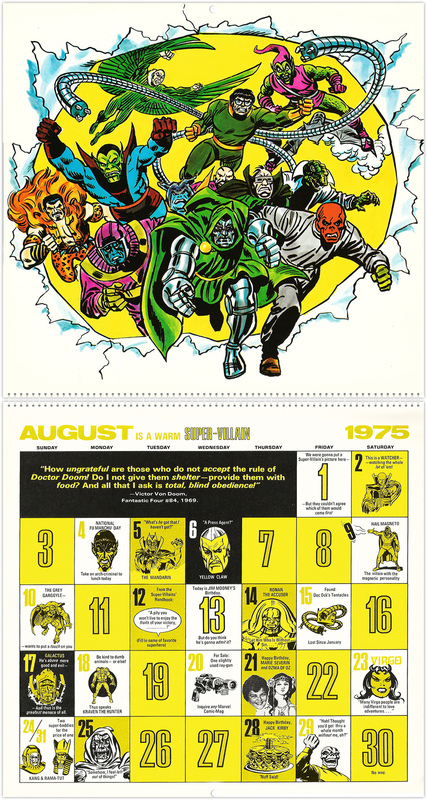 The spiral bound calendar, measuring 11½ x 11 inches, was printed on medium thick card stock and featured an illustration of either one, or a group, of Marvel superheroes pencilled by one of the publisher’s most popular artists. 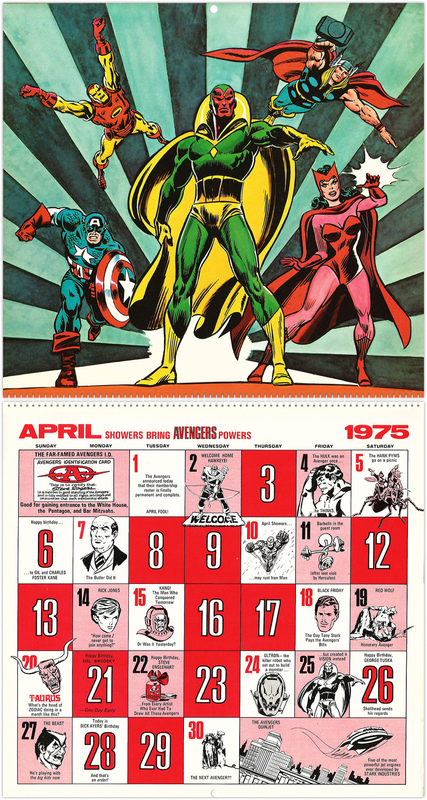 On the opposite page were that month’s calendar dates with repurposed illustrations, witty comments and Marvel Bullpen staff birthdays — ever wondered when Gerry Conway celebrated his birthday? Then look no further. 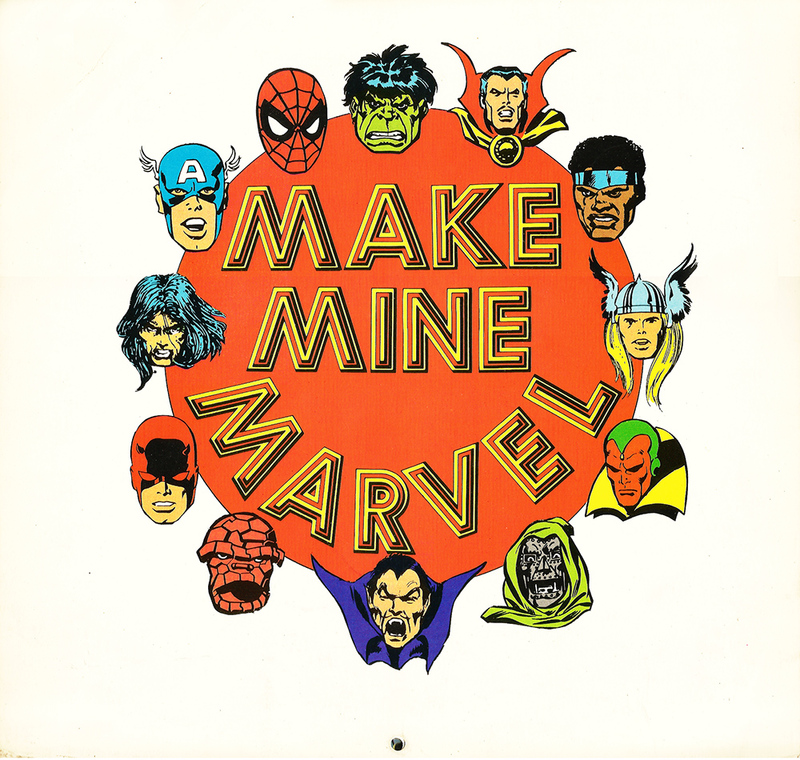 The artwork was, on the whole, very good. 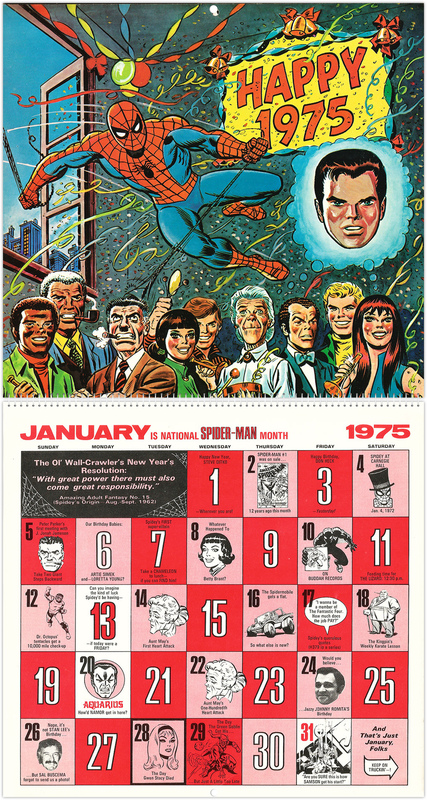 Marvel Art Director John Romita, Sr contributed the most, including both covers and — unsurprisingly — the month that featured Spider-Man (January). 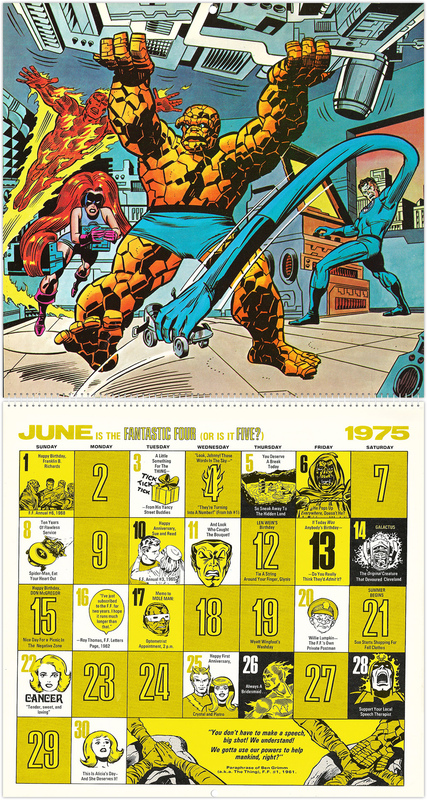 He was joined by Frank Brunner (February), John Buscema (April), Barry Smith (May), Jack Kirby (September), Mike Ploog (October) and Gill Kane (November). 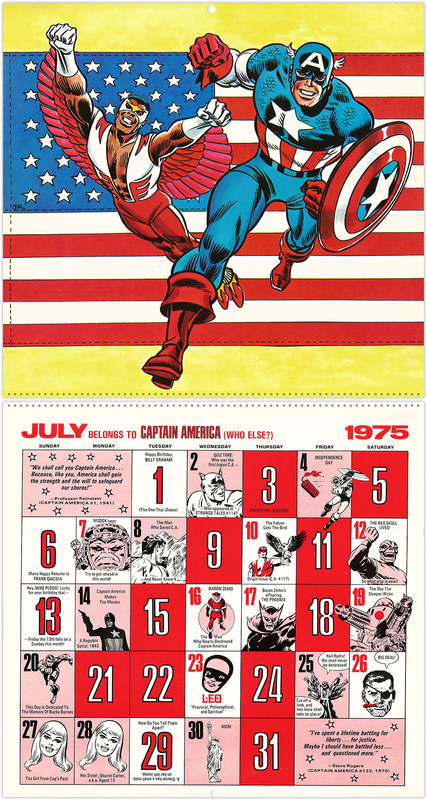 And most of Marvel’s biggest stars were also represented: The Hulk, Captain America, The Fantastic Four, The Avengers and Thor, to name a few. 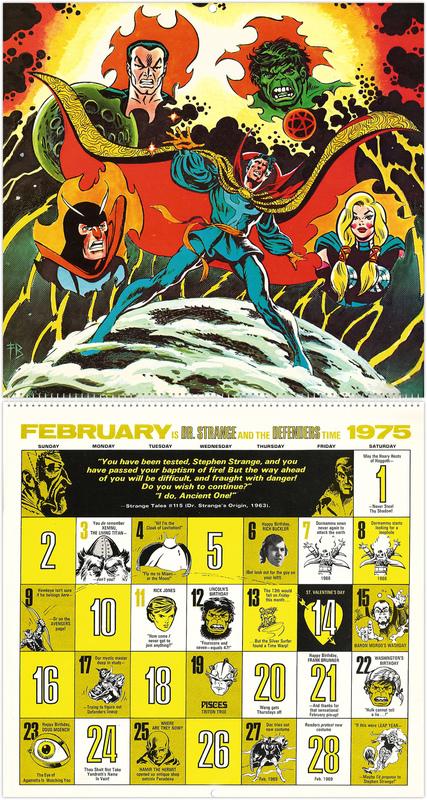 Apart from the artwork and dates the calendar also included a look at the calendar as a whole and a ‘Dazzling Decade of Fabulous Facts’, a list of notable events from the Marvel Universe. 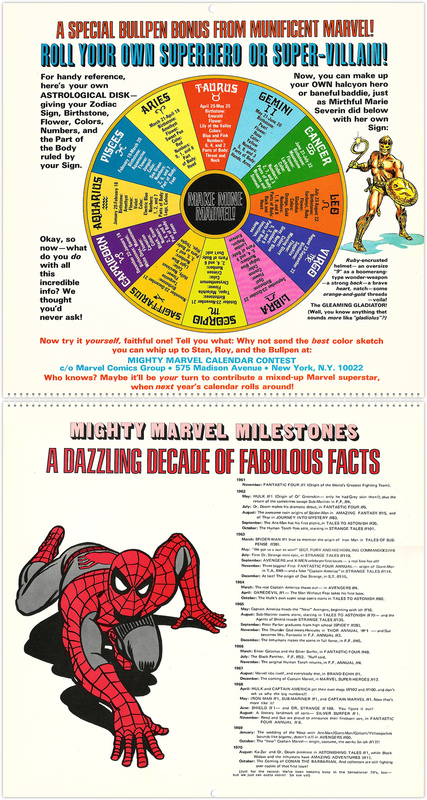 Also included was a ‘Special Bullpen Bonus’, an astrological disk that helped readers create their very own horoscope-themed superhero. 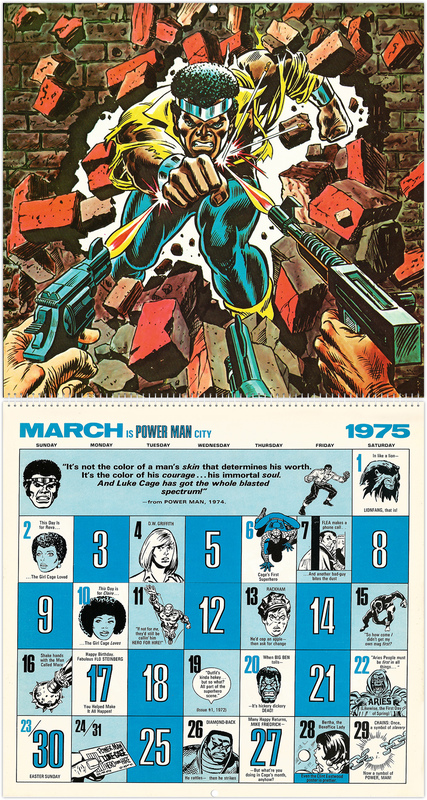 Fans were asked to send their completed creations to Marvel who (kind of) promised to feature the winner in the following year’s calendar (the lucky winner was Joe Binggeli’s Capricorn, which appeared in The Mighty Marvel Bicentennial Calendar 1976). 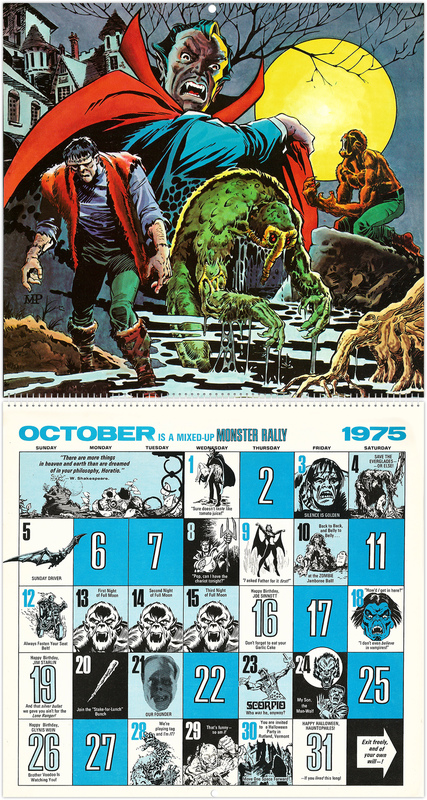 I’ve always had a soft spot for these calendars. 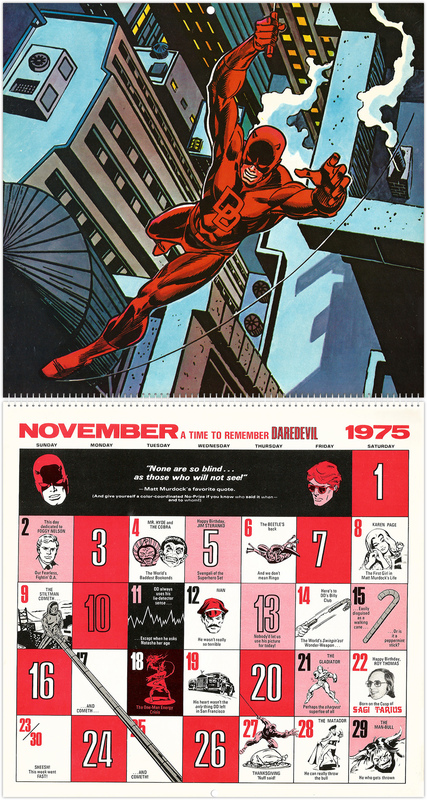 Not only was the artwork of a high standard, but I loved the witty (albeit cheesy) banter. 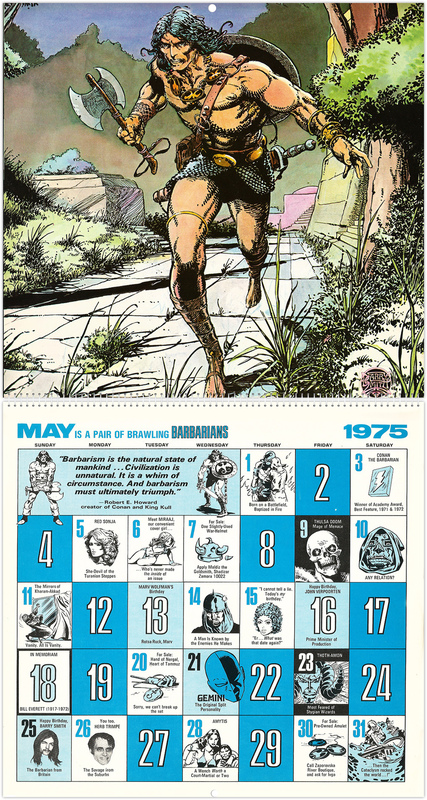 It really felt as if the bullpen had actually created the calendars themselves (and had fun doing so), and having a different image to look at each month was a treat. 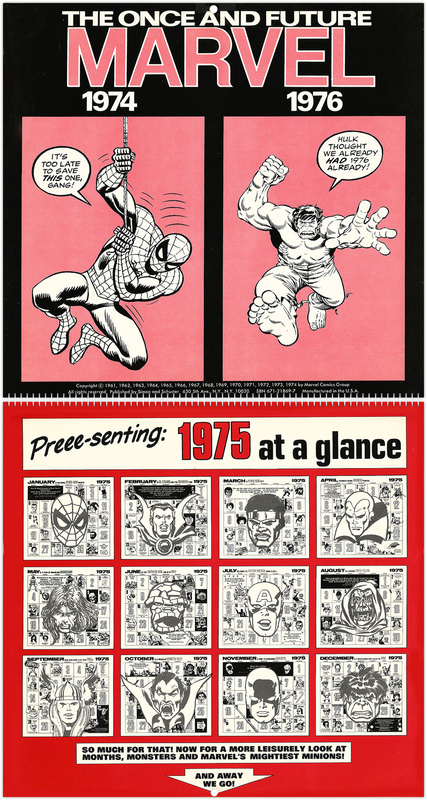 Here are all 12 months from the Mighty Marvel Calendar for 1975, Along with the inside and outside covers — enjoy.